Would you call these enclosures shimari? This wild experiment performed by the top player in the world means that even professionals have no idea about the best way to play in the beginning. Bill Spight: "No idea" is a little strong. 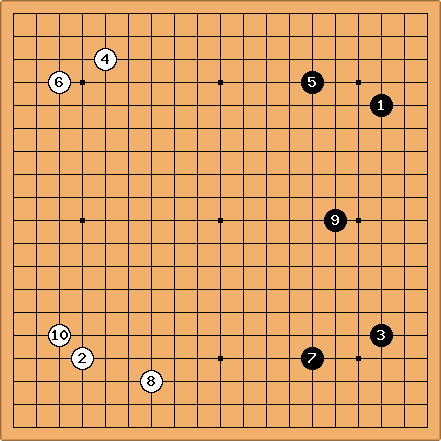 In the opening there are many plays that are approximately equal. Nobody knows what the best play is, or even if there is only one best play (allowing for symmetry). mattn: Tengen or thereabouts seems like a big point, but maybe something more direct is in order? JoanPonsISemelis: Tengen seems too close to Black's 9 to me. 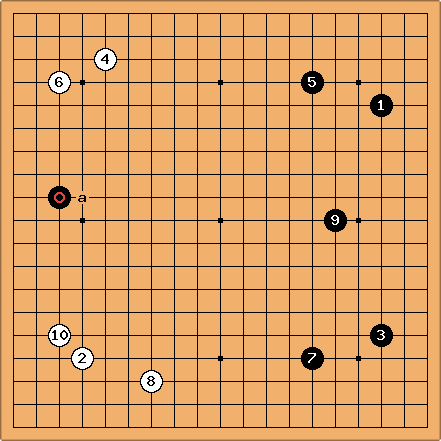 I would also play wariuchi, but at a, one line higher (high wedge). Dieter: This proves that if pros play fixed patterns, they do so because it fits their plan, while we do so because we believe that anything else is ridiculous. JoanPonsISemelis: Patterns become fixed when pros play them often, but even if (of course) pros are aware of which patterns are played often, I don't think that they play them because of that. emeraldemon: I think it's worth remembering that this was played in televised speed-go tournament (KBS). In such situations I think unusual openings are more common.